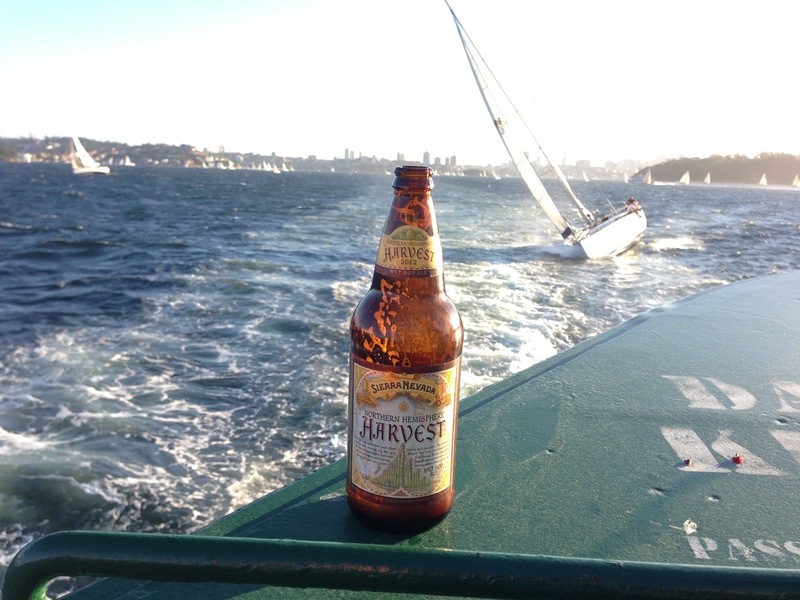 It’s been a long between drinks for a classic BotF post that is simply about a beer drunk on the Back of the Ferry. That’s what tonight’s post is. 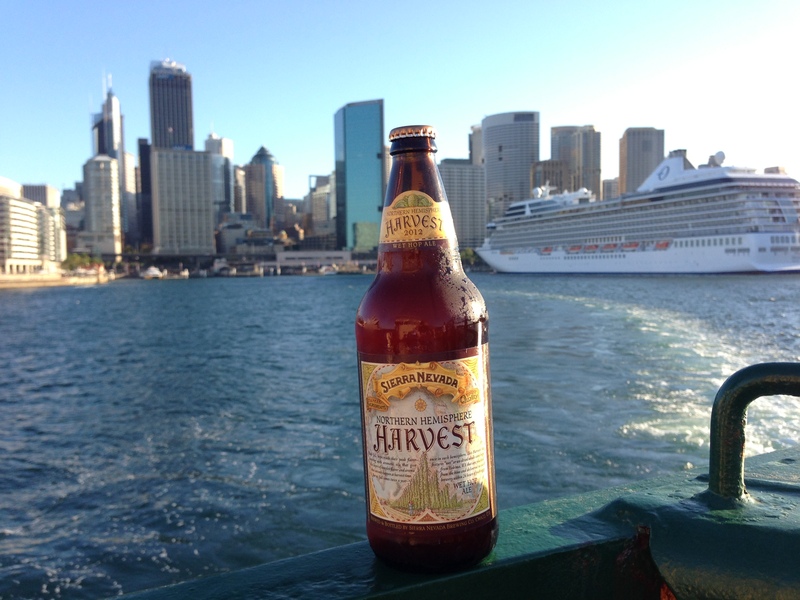 On the way to Circular Quay I pulled into Vintage Cellars on Carrington Street and spotted a 2012 vintage of the Northern Hemisphere Harvest made by Sierra Nevada. This is a special beer that is deserving of the full Back of the Ferry beerp0rn treatment. That includes the iconic Opera House shot, which on a blue Sydney day like today just doesn’t get any better. Normally the yacht frenzy occurs on a Friday evening, but tonight the stiff breeze had all sorts of yachts beating, tacking or whatever it is that they do. Happy to sit on the stern and watch. The effort to which Sierra Nevada goes to for this beer is pretty exceptional. There’s plenty of “paddock to plate” stuff going on in restaurants at the moment and this is the beer equivalent of it. 24 hours after these hops are picked- they are in the kettle brewing away. The Sierra Nevada website will explain more technically than I can – but this is as fresh as it gets. 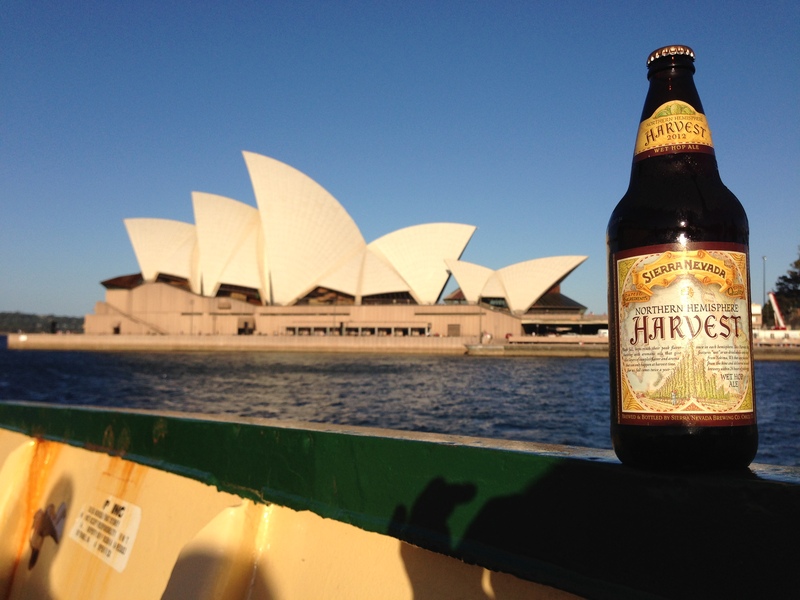 Globalisation means that we are drinking the Northern Hemisphere Harvest in the Southern Hemisphere and it tastes great. This is seriously good beer. Love the big bottle. The hops are lipsmackingly good – there’s a piquantness that lasts and lasts. Even as I sniff the bottle, which I’ve kept to monitor beer label hyperbole, the fresh, grassy hop smell lasts and lasts. Don’t pass this up. It might be $12 a bottle (don’t get that given the Aussie peso’s strength), but it’s worth every sip. Jam it in an ice bucket, have it by the table and just enjoy it slowly. Which boat would you rather be on?